Instant Win Game & Sweepstakes: Lindt Excellence Discover Your Perfect Pairing! 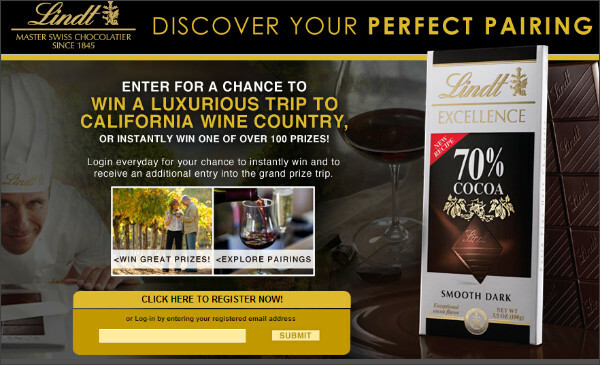 Go here to play the Lindt Excellence Discover Your Perfect Pairing Sweepstakes & Instant Win game for your chance to win a trip to California wine country or you could instantly win one of 100 prizes! Just go here to register. Don't have a UPC code to enter? That's OK! Just click "Get a UPC" and it it instantly fill one in for you!